Inspired by Live Aid, Willie Nelson, John Mellencamp, and Neil Young organize Farm Aid, a concert in Champaign, IL to benefit American family farmers. Other performers include Bon Jovi, Billy Joel, Johnny Cash, and Lou Reed. Farm Aid started as a benefit concert held September 22, 1985, in Champaign, Illinois, to raise money for family farmers in the United States. The concert was organized by Willie Nelson, John Mellencamp and Neil Young, spurred on by Bob Dylan’s comments at Live Aid earlier in that year that he hoped some of the money would help American farmers in danger of losing their farms through mortgage debt. (1985) Musicians perform to help family farmers. English playwright Ben Jonson, whose later literary achievements will be outshone only by Shakespeare, finds his career, and life, nearly ending before they really begin. The 26-year-old is brought up on charges for the killing of an actor, but acquitted after reciting a bible verse. Considered the 20th-century’s lengthiest conventional war, the Iran-Iraq War begins as Iraqi forces invade an oil-rich Iranian border area. What will follow is almost eight years of battle that claims hundreds of thousands of lives but leaves the countries’ borders virtually unchanged. California’s Huntington Library shocks scholars as it releases photocopies of one of the top archaeological finds of the 20th century, the Dead Sea Scrolls. The ancient Jewish biblical texts, previously available to only a few researchers, are now accessible to all. Considered the 20th-century's lengthiest conventional war, the Iran-Iraq War begins as Iraqi forces invade an oil-rich Iranian border area. What will follow is almost eight years of battle that claims hundreds of thousands of lives but leaves the countries' borders virtually unchanged. The Iran–Iraq War was an armed conflict between Iran and Iraq lasting from 22 September 1980, when Iraq invaded Iran, to August 1988. The war followed a long history of border disputes, and was motivated by fears that the Iranian Revolution in 1979 would inspire insurgency among Iraq's Shi'ite majority, as well as Iraq's desire to replace Iran as the dominant Persian Gulf state. Iraq planned to annex the oil-rich Khuzestan Province and the east bank of the Shatt al-Arab. top left: Military use of children in Iran-Iraq war. 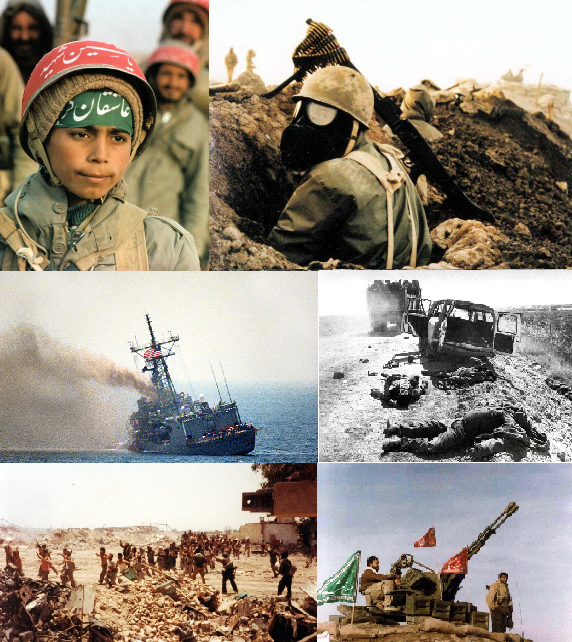 top right: Massacre Iranian Civilians by Iraqi Troops at first of Iran-Iraq War. middle left: A port quarter view of the guided missile frigate USS STARK (FFG-31) listing to port after being struck by an Iraqi-launched Exocet missile on the 17th of May 1987 middle right: Mujahedin was killed in Operation Mersad by Pasdaran in Kermanshah below left: In re-taking Khorramshahr, the Iranians captured some 19,000 soldiers from a demoralized Iraqi Army in 1982 below right: Army of the Guardians of the Islamic Revolution & Islamic Republic of Iran Army used many zu-23 in Iran-Iraq war.